There are good movies, bad movies, and movies in between. “Cyrus,” the latest from Fox Searchlight Pictures, transcends these categories. This movie could qualify as a vile form of psychological torture. 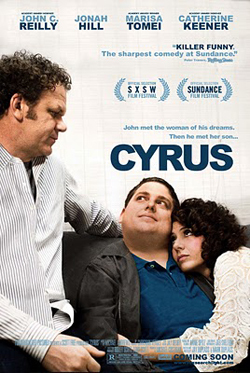 “Cyrus” is currently in selected theaters and is one of those rare films that has absolutely nothing to recommend. The acting is flat, the dialogue is bland, the cinematography is amateurish, and the plot moves so slowly that the first five minutes of the movie feels like an hour. The basic plot concept is brilliantly dark. John (John C. Reilly) meets the woman of his dreams at a party that his ex-wife, Jamie (Catherine Keener) forces him to go to. John and Molly (Marissa Tomei) hit it off and start dating. All goes well until John meets Molly’s adult son, Cyrus (Jonah Hill). The problem lies in the fact that Cyrus and Molly have an unusually close relationship. As John and Molly grow closer, Cyrus is revealed to be manipulative, cruel, selfish, and determined to make sure the little world he and his mother share stays exclusive. A good idea like this deserved a better chance. The writers failed to take advantage of the many opportunities for macabre humor. There are only a couple of good comedic lines in the whole movie, and most of what little humor there is comes from Reilly’s gift for subtle facial expressions. To make matters worse, none of the actors give their best in this one, though Reilly and Keener try. Hill struggles to achieve a creepy vibe but comes off as a pathetic loser. As far as cinematography is concerned, the director looks to have tried for an “indie” feel, but it winds up looking incompetent and confusing. The film often looks like a group of kids got their hands on professional equipment and made a home video. All in all, “Cyrus” suffers from a case of good concept gone horribly wrong. The few humorous moments aren’t nearly enough to outweigh the headache-inducing awfulness of the rest of the film. “Cyrus” is a bad film. Plain and simple. Avoid this one at all costs, folks.